Want to discover more about David? 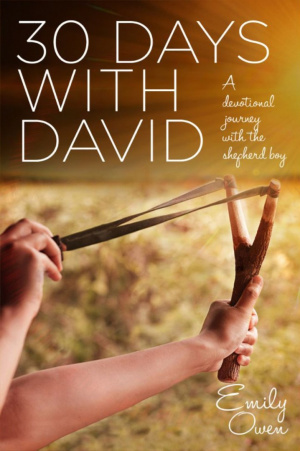 A thirty day devotional look at 'David's diary' with thought provoking points, prayers and questions to help explore this much-loved story in a new way. How do you suppose David felt being plucked from the obscurity of caring for sheep to becoming the King of Israel? Emily Owen explores these questions through David's 'diary', sharing in his trials, his victories, his challenges, fears and joys. Each reading begins with a diary extract from David's life, which is then beautifully unpacked with a meditation to encourage the reader to reflect on how that applies today. Each meditation is encouraging yet challenging, uplifting and helpful for personal growth. A wonderful book to help readers look again at familiar Bible stories with a fresh perspective. 30 Days with David by Emily Owen was published by Authentic Media in September 2017 and is our 17097th best seller. The ISBN for 30 Days with David is 9781780784496. Be the first to review 30 Days with David! Got a question? No problem! Just click here to ask us about 30 Days with David.